Powers/Abilities: Trader could cloud the retinal input of anyone who looked at him, allowing him to blend into his surroundings. 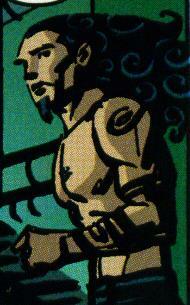 His powers also allowed him to alter his appearance to a point, as he made his hair appear longer, gave himself a goatee and several tattoos. History: BTS- Trader was a stockbroker on Wall Street before being fired after a co-worker outted him as a mutant. He found his way to Chicago and joined the enigmatic Postman's Morlocks. (Morlocks#1)- Trader was one of the Morlocks who came to the mutant Cell's rescue when he was being chased by cops. Trader took a bullet in the shoulder for him, and wasn't exactly happy about having an obvious gangbanger like Cell in the group. (Morlocks#2)- After an argument between fellow Morlocks Electric Eve and Angel Dust, Trader yelled at Eve for being too hard on the younger Angel. However, after Eve played the part of a toaster in her drug dealer ex-boyfriend's hot tub, Trader was the first one to check on her. Telling her revenge was hollow, she said she loved it and so would he. At that moment, Dr. Metellus' Sentinels arrived. (Morlocks#3)- After narrowly escaping the Sentinels, Trader came to Eve's defense after Postman yelled at her for endangering the group to get revenge on her ex. Trader told him about how he lost his plush job because "the jerk two offices over" outted him to the board. All he lived for was revenge. Just then the police rushed into their sewer headquarters, and Trader jumped in the way of a bullet intended for Eve. As he died, he commented on how he didn't think he'd ever take a bullet for someone again. Trader was quite the older brother in this Morlocks group, as he was often harsh, but genuinely cared about the other members. I mean, he gave up his dream (A crappy one, sure) just to protect a fellow member.